Composite image of the super star cluster "Westerlund 1" from 2.2-m MPG/ESO Wide-Field Imager (WFI) observations. In this space wallpaper, a composite image of the super star cluster "Westerlund 1" from 2.2-m MPG/ESO Wide-Field Imager (WFI) observations. The image covers a 5 x 5 arcmin sky region and is based on observations made in the V-band (550 nm, 2 min exposure time, associated to the blue channel), R-band (650nm, 1 min, green channel) and I-band (784nm, 18 sec, red channel). Only the central CCD of WFI was used, as the entire cluster fits comfortably inside it. 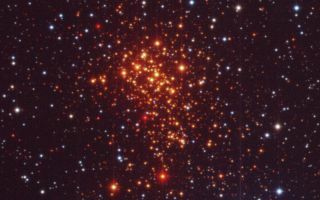 The foreground stars appear blue, while the hot massive members of the cluster look orange, and the cool massive ones come out red.